On May 4th of this year, before trekking down the final two of our eleven National Scenic Trails, the Nimblewill Nomad headed out on the Ozark Trail (OT), right here in his home state of Missouri. 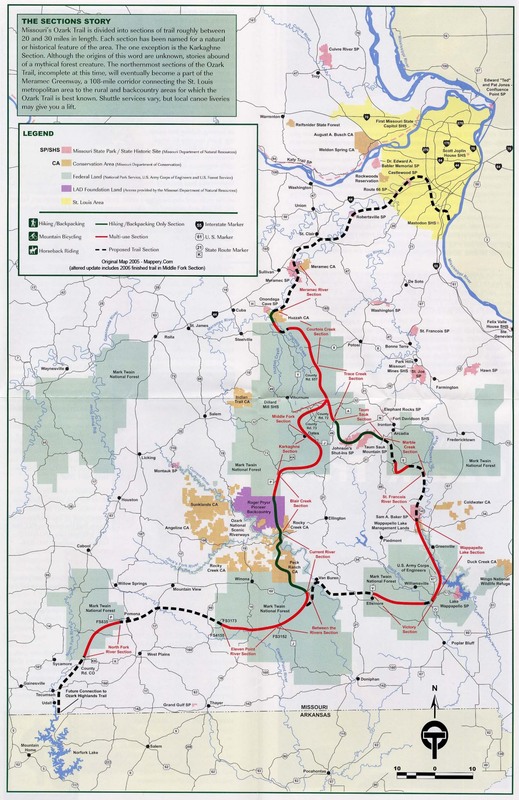 Of the 500 miles of proposed trail in Missouri, some 350 miles of the Ozark Trail have been completed. Isolated sections are interconnected (for now) by somewhat lengthy roadwalks. It’s a scenic-but-rugged trail, as it traverses the highest land between the Appalachians and the Rockies, the Ozark Mountains, as they’ve come to be known. And these Ozark Mountains? Well, they could be more correctly categorized as highlands, since they sprawl across an elevated, deeply dissected plateau. And for sure, the region is unique, certainly as to its culture, in both folklore and folksong. The descriptive term Hillbilly, or Ozark Hillbilly; they’re pretty much synonymous (Yup, that’s Nimblewill!). It’s a remarkably diverse region. Here can be found mountainous terrain marked by deep valleys through which clear, meandering streams flow. Caves are numerous. Hillsides throughout are heavily forested in oak, hickory, and pine. Minerals abound. Agriculture, forestry, mining, tourism, they’re the mainstay. As the Nomad left Missouri, he continued his trek along the Ozark Highlands Trail. This cross-country route in northwest Arkansas stretches 165 miles from Lake Fort Smith State Park, across the Ozark National Forest, to the Buffalo National River. The trail passes through some of the most remote and scenic portions of the Ozark Mountains, like the Hurricane Creek Wilderness Area. It also visits White Rock Mountain, Hare Mountain, the Marinoni Scenic Area, and countless other breathtaking spots, and crosses more than 60 named creeks, streams and rivers, passing hundreds of seasonal waterfalls, lots of sandstone bluffs, giant boulders and scenic vistas. The Nomad completedp his Triple-O odyssey on the Ouachita Trail, which stretches 223 miles through the beautiful Ouachita Mountains of Arkansas and Oklahoma. The first 192 miles lie within the Ouachita National Forest; the remaining 31 miles, maintained by Pinnacle Mountain State Park, traverse lands owned by timber companies and Central Arkansas Water. He picked up the Ouachita Trail in Oklahoma at Talimena State Park, some 90 roadwalk miles southwest of Fort Smith. From there the Nomad trekked the Ouachita east, back into Arkansas, then on to Pinnacle Mountain State Park near Little Rock. 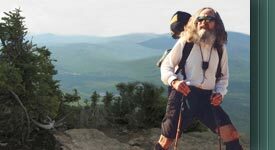 Elevations range from 600 to 2,600 feet as the trail passes through forested mountains, across sweeping valleys and near clear-running streams.